My friend, Coby Dillard, has posted a rather lengthy screed on his Facebook page about the lack of Republican outreach to the black community. My response to him is far too long to post there, even if I wanted to. So here it is. I believe Coby missed a much larger point in his missive, a point often missed by people who only see race in terms of a black/white issue. I know – I used to make the same mistake myself. The Republican Party doesn’t have a black problem; they have a non-white problem. Anyone who is not white is dismissed as a potential Republican voter. Voter ID laws that have passed in a number of states weren’t targeted just at black folk, but all minorities. Harsh stances on immigration weren’t targeted at black folk at all. 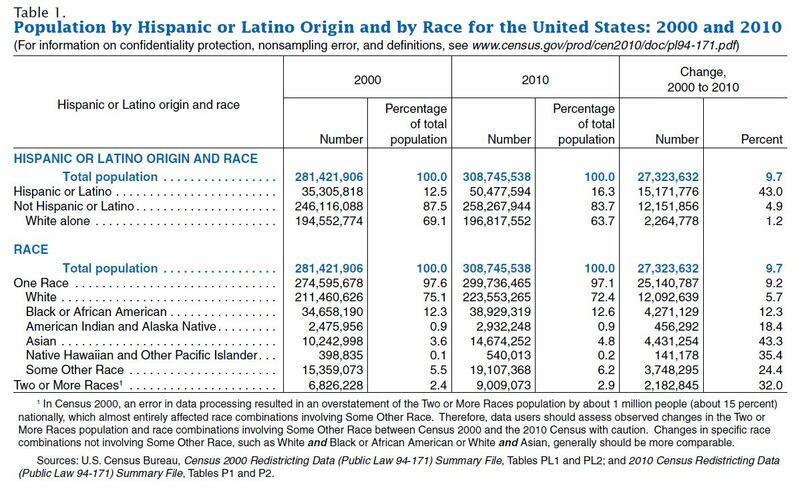 At 12.6% of the population (pdf), blacks aren’t even the largest minority group any more. Hispanics claim that mantle, with 16.3% of the population – and growing. The Asian population, pegged at 4.8%, was the fastest growing minority group from 2000 to 2010. Most projections put whites in the minority in this country by 2050, but it could be as early as 2019. According to exit polls, the electorate is less white – 72% – than it was just four years ago – 74%. Blacks made up just 13% of the electorate in both years, so we weren’t responsible for the decrease in the white vote. Hispanics increased from 9% to 10%, and Asians from 2% to 3%. President Obama received 93% of the black vote, which is actually down from the 95% he received in 2008. But he received 71% of the Hispanic vote, an increase of 4%, and 73% of the Asian vote, an increase of a whopping 11%. Yes, Mitt Romney received 59% of the white vote, an increase of 4% over that received by John McCain. But if the numbers are true – and exit polling is about all we have to look at – the Republican Party is banking their efforts on a decreasing share of the electoral pie. Republicans have lost the popular vote in five out of the last six presidential contests. More Democrats voted for Congressional candidates than did Republicans. Only because of gerrymandering* do the Democrats not have control of the House of Representatives. Bottom line: this isn’t just about the black vote. This is about the increasing non-white vote. Until the Republican Party figures out not only how to reach out but also appeal to those voters, they will continue to lose elections. * – Gerrymandering occurs because the turnout among non-white and younger voters in other than presidential election years is far lower. It’s why Virginia has a Republican governor, a huge Republican majority in the House of Delegates and a 20-20 State Senate. Those are the folks who approved the Congressional lines that made Democratic seats more Democratic and Republican seats more Republican, the result being not a single change in our Congressional delegation, where Republicans enjoy an 8-3 majority. If the 2009 electorate had looked like that of 2008, it is likely that would not have been the case. Here’s hoping the 2013 Virginia electorate looks more that of 2012, which voted for President Obama and Tim Kaine. Next Post Friday fun: how should you de-stress? Much of what you say in this post is true, but I don’t think it’s very likely that the partisan makeup of congressional districts would be much different had Democrats controlled things in Richmond. Redistricting is the ultimate in political hardball and the two major parties know it. That’s why it’s almost always the case that districts get more friendly to incumbents of both parties regardless of who is in power. Incumbents like to be reelected and, despite the fact that it comes at the expense of voters, drawing district lines to protect incumbents is something that Republicans and Democrats usually unite on in just about every state that does redistricting through the legislature. That’s why, for instance, the 3rd District got better for Bobby Scott while the 2nd District got better for Scott Rigell; Republicans in the General Assembly knew the best way to insure Rigell’s reelection was to insure Scott’s reelection too. It’s been this way for ages and shows no signs of changing any time soon, even if the sainted Democrats were to control the legislature. You are correct no matter what party controls redistricting. It will always be slanted to make sure they win. That is why making sure the redistricting is non-partition is so important. I really liked the student contest they had this year to draw the lines. They were much better. The General Assembly does not need to wait 10 years to look at this again or we will be in the same position 10 years from now. I don’t disagree that the the parties control of redistricting is bad – I’ve said so over and over. As for this past redistricting cycle – there was a competing Congressional plan from the Democrats in the Senate that would have altered the partisan makeup of the districts. Take a look at the plans here, in particular the ones offered by Sen. Locke. The big difference was the 3rd and 4th CDs. Redistricting needs to be removed from the hands of the legislature. That’s the only way we can select our representatives, instead of them selecting us. If it was legal to lower the percentage of black voters in the 3rd district and move them elsewhere, Rigell and Forbes could have easily been beaten. We have a two term black President now, I think its time to ditch the idea that minority congress-members can only be elected by constituencies that are majority-minority. There is no reason the force of government should be used to discriminate against voting populations based on race. It’s not like Bobby Scott really needs to win with 80% of the vote. 60% would be more than adequate. Isn’t that what the Senate plan did – reduce the black vote in the 3rd and shift it (back) to the 4th? One problem with that, Max: not a single Black Democrat was elected from a majority White district. You’re wrong, ZAG. All of the “shadow” congressmen from DC are White, and TN9 (63.5% Black) is represented by a Jew (and not a Black Jew, either). DC politics are a world unto themselves. I’m aware of that, ZAG. That’s why I mentioned DC. Mark was in VB Tuesday (allegedly at the behest of the White House) to look into the situation. The other issue I think the Republican party had with a lot of people I talked to this election was not only do they have a non-white problem but a non-male problem. I have friends who are very loyal Republicans who were not happy with the extreme stances some of the candidates took towards women issues. They were upset but said well the economy was their deciding vote. I took that to mean I am not as important as the whole. However, what if in 4 years the economy card is not there to fall back on. I think they need to look at these concerns and address them. …It’s an interesting measure that 93% of the the American people who happen to be African American voted for the candidate who happened to be African American. An alternative perspective would be if 93% of Americans who happened to be white also voted for a candidate who happened to be white. Until we are honest enough to dispassionately discuss why race is such a factor in something as basic as to why we vote for one candidate or another, we are seriously deluding ourselves. I happened to be Norfolk this week and caught a quick shot of one of my personal heros, Vivian Paige, talking on WAVY about long waiting times to vote at particular precincts, I agree with Vivian’s assertions that prejudice/race needed to be examined to see if they were the reasons for the long lines. Blacks voted for the Democratic candidate. It’s not a huge leap from the 88% that Kerry got in 2004 to the 93% Obama got. As for the voting, FWIW here is one poll report that minorities and Democrats waited longer to vote Tuesday. It was 95% in 2008 I recall. Fact is every poll I’ve ever seen had a +\- of about 4 or 5 points so it wouldn’t be a huge leap to say President Obama got more then the generally excepted figure of 95%. In some 12 step programs one of the steps (#4) is that you do a searching and fearless moral inventory of yourself. “Fearless” meaning that whatever you admit to yourself; it is the truth regardless of what it is. You except it and move on. It applies to all our character flaws regardless of who we are or what they are. I’m unwilling to forget that blacks have supported the Democratic Party for 50 years. That the support is based on its support of us. And the facts show it, which is why I gave the Kerry numbers. Yes, there are black people who vote for Obama simply because he’s black. I’d venture to say that the delta between Kerry’s numbers and Obama’s numbers reflect that. But we are talking about a small percentage. Further, as those on the far right have waged a racist-tinged battle against Obama over the last 4 years, it’s a wonder Obama didn’t get 99% of the black vote. The system that produced gerrymandered, overwhelmingly black districts has contributed to race-based voting. I’m not sure that Max is right – that the VRA should be scrapped – but the unholy alliance between Republicans and black Democrats has exacerbated the problem. Depends on how you look at it, Vivian. From the other side, you could say that MORE THAN HALF of the Blacks who voted for Bush voted for Obama because of his race. And you DO have to be concerned that White Democrats are so racist that there is not a single Black democrat in the House of Representatives that was NOT elected from a majority-minority district. You could have just as easily stated that not a single White Democrat was elected from a majority Black district. Maybe not now, but for years they were. And there is at least one white member in the General Assembly right now who represents a majority black district – Joe Morrisey. I call them as I see them… one (1) Black majority district represented one (1) white guy. Joe Morrissey. Good life long Democrat; I’ve always liked him in spite of the things he’s done to himself. I think DOJ would have approved it. They really didn’t challenge redistricting plans. It seems to me that Virginia Beach is reaping the results of moving the May elections to November. It took people MUCH longer to vote this election — time IN THE BOOTH, I mean. The Amendments were esoteric and really not a topic of widespread public debate, so time was needed to digest the meaning and implications. Shall Section 6 of Article IV (Legislature) of the Constitution of Virginia concerning legislative sessions be amended to allow the General Assembly to delay COMMA by no more than one week COMMA the fixed starting date for the reconvened or “veto” session when the General Assembly meets after a session to consider the bills returned to it by the Governor with vetoes or amendments? Seriously? How’s that been working out for Blacks? The original arguments for Minimum Wage were to price Black workers out of the labor market in the North. Minimum Wage once again destroyed the employment opportunities for Blacks, mainly young Black men, when implemented after the Democrats took control of the House and Senate in 2007. Like the Minimum Wage, illegal immigration disproportionately impacts Blacks, especially young Black men, because illegal immigrants undercut young Black men in the market for unskilled labor. Employers can hire illegal immigrants or less than they can hire young Blacks. I do give Obama credit for some increase in enforcement against the emplyers, but the penalties for hiring unlawful aliens should be much higher, and Obama opposes and Instant Check requirement. Obama has also done nothing, and proposed nothing, to simplify and streamline the LEGAL immigration process. Many people come here illegally because it is so hard to come here LEGALLY. That is insane. Immigrants are a vital leaven for America. But the ones we want are the ones who respect our laws, and we keep them out with overly restrictive quotas. In short, what have the Democrats done for Blacks?